In response to the September 2018 United Nations Food and Agriculture Organization’s (FAO) call to action, we are seeking contributions for book chapter proposals. Specifically, we request case studies on climate change resilience frameworks for nutrition-focused transformations of agriculture and food systems for food security and health of populations living in vulnerable conditions. Volume contributors are asked to address the local challenges that these ongoing food system transformations present from diverse cultural contexts and geographical areas. Particular attention will be given to the catalytic role that anthropologists can provide in community-driven participatory action research and practice. Chapters will illustrate forms of resistance, resilience, and adaptations of food systems to climate change. Consideration will be given to research on: 1) enhancing food sovereignty for rural and urban underserved populations; 2) improving locally contextualized definitions and measurements of food security and hunger; 3) informing public health programs and policies for population health and nutrition; and 4) facilitating public and policy discourse on sustainable futures for community health and nutrition in the face of climate change. The Story of Soy. Christine M. Du Bois. London: Reaktion Books, 2018. 266 pp. + References and Index. ISBN 978 1 78023 925 5. Anyone interested in global diet and agriculture should be interested in soy because it is by far the most grown oilseed and fourth most cultivated crop in the world (after the cereals maize, wheat, and rice) (p.223). As a major source of plant protein, it sustains the diets of humans and livestock, and has contributed the world over to agricultural livelihoods and nutrition. That said, this voluminously documented volume takes care to situate soy in its diverse historical and contemporary contexts. It shows how soy in each era paradoxically created conditions to sustain life, including fixing nitrogen for agricultural ecosystems, but also to destroy environments and societies through relentless and sometimes violent pursuit of food and wealth based on soybean cultivation, processing and distribution. The opening chapter, “Hidden Gold,” introduces readers to the long-term history of soy, as a food, feed, and industrial crop, and to major flash points, like the Russo-Japanese war of 1904-1905, which made soy loom large in political-geographic history. Chapter 1, “Asian roots,” speculates about soy’s original domestication and diffusion as a significant food that was processed to facilitate and extend its nutritional reach. Chapter 2 documents the European history of soy, including war-related developments that expanded soy’s nutritional potential to feed hungry populations that could afford little meat. Chapter 3 turns to United States adoptions and genetic and agronomic improvements for food, feed, and industrial purposes. Chapter 4, “Soy Patriotic” returns to Asian soy as a war and post-war crop. Here the stories include post-World War II innovations, like citric acid processing that removed off flavors, and utilization of stainless steel processing equipment that prevented contamination. These stories include how soy became implicated the development of the defoliant, Agent Orange, which drew botanists into ethical and political opposition to the Vietnam (American) War after military scientists used their basic research understandings of crop maturation to de-forest Vietnam and expose fighters’ hiding places. ‘ ’Growing soybeans and other crops poses many actual and potential challenges to environments, including habitat loss, monoculture, genetic modification, toxic chemicals, climate change, erosion, and depletion of fresh water. But fatalism is misguided: the destructive effects of farming can (emphasis in the original) be mitigated through careful research and ingenuity. No-till cultivation, pest control through organic methods or chemicals with reduced toxicity, effective penalties for environmental rule-breakers and a reduction in meat eating that drives so much agriculture can each make a genuine difference. The question is how much effort we will put into protecting our natural world. This is our only world. There is no other planet for us. There is no ‘escape hatch’ from our responsibilities—or from the consequences of our actions.” (p.172). Readers here get a sense of the author’s ambivalent sensibilities, which are also passionate, and draw on a complete range of pro- and anti- technology advocates. The book could have ended here. But wait, there’s more. The two-sided approach continues, in subsequent chapters on nutrition and international business and trade. Ch.8, “Poison Or Panacea” discusses the positives (accessible protein) and negatives (anti-nutritional and allergenic factors) associated with soy nutrition, and also certain health issues, like relationship between soybean consumption, female estrogen levels and male sperm counts, and a range of possible risks and benefits associated with more extensive genetic engineering of soybeans for food and medicine. There are also added discussions of soy in disaster relief and food aid. Chapter 9 examines “Big Business”, which is largely under the control of a few very large agricultural production, processing, and trading firms, like ADM. In this chapter, readers can follow the journey from mid-western farm to global feedlot or food processor. The author adroitly unpacks the abstractions and workings of commodities futures contracts, including the thought processes of hedgers and speculators, winners and losers. (There’s even a reference to the 1983 hit movie, “Trading Places” and FBI investigation of fraud on the Chicago Mercantile Exchange (pp.226-232)). There follow the dynamic mergers and acquisitions among leading seed (biotechnology) companies competing for markets, the politics of managed markets and subsidies in industrialized, developing, and transition countries; and finally, the land grabs that have characterized soy-growing areas especially since the world food price crisis of 2007-2008. These business and environmental concerns spill over into Chapter 10, on “Soy Diesel”, which continues country-by-country discussions of soy strategies such as efforts to recycle soy oil in order to cut down on pollution and waste in Brazil and Indonesia. In all these developing country stories, however, the reader sees the downsides, as small operators inevitably lose access to food and energy resources when world prices rise beyond their control. The book ends with an “Afterword” about Svalbard Global Seed Vault in Norway, which harbors some 27,000 varieties of soy. This short chapter ends with a rehash of the individually grounded, cultural stories that show promise and peril inherent in soybeans, which are used as a “lens for new perspectives on our very selves.” (p.266). Readers can decide whether they appreciate and want to use these reflections to structure discussions of additional, non-soy domains. 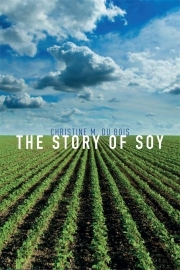 As I was preparing this review of Christine Du Bois’s comprehensive, The Story of Soy (London: Reaktion Books, 2018) I happened to read an “early view” of Andrew Ofstehage’s (2018) “Farming Out of Place,” which describes “flexible farming” modes of production by a younger generation of mid-Western US farmers, who buy up and farm South American lands after they have been priced out of the land market in their home places of origin. I also read and reviewed Gerardo Otero’s Neoliberal Diet, which covers some of the same territory from a quantitative, larger-scale agricultural and nutritional perspective, focusing in part on the huge growth of plant fats in global diets. To cover community cultural and the “big” political economic picture, I’d recommend that readers and instructors in food-studies and anthropology of food, nutrition, and diet courses use all three sources together. Finally, as someone who has followed Du Bois’ work on soy (Messer 2009, 2016), and also as someone trained in ethnobotany, I particularly appreciated Du Bois’ exhaustive dedication to exploring the entire range of relations between this economic and nutritional species and the human populations that have used and will continue to use it. I look forward to reading comparative studies on other oilseeds based on the excellent research presented here. Otero, G. (2018) The Neoliberal Diet. Healthy Profits, Unhealthy People. University of Texas Press. We experience the world and our food with all our senses, so why not get tactile as we discuss risk and privilege in relation to food? Princeton University’s Col(LAB)—a product of the synergetic confluence of collaborations between the Program in American Studies, the CST StudioLab and the Princeton Food and Agriculture Initiative—immerses participants in the intersecting spatial realms of classrooms, farmer’s markets, food pantries and dining hall kitchens to bring together various perspectives on pressing food issues through a venture involving “creativity and the unexpected,” said Anne Cheng, Professor of English and Director of American Studies. While the concepts of risk and privilege were left relatively open for interpretation, through interactive experiences, participants come together to understand how economic (in)stability, food (un)safety and social stratification may affect personal, everyday habits and decisions surrounding food. Participants included faculty, undergraduate, graduate students, staff, dining chefs, nutritionists and experts from within and beyond Princeton University. The three-day workshop started off with a visit to the farmer’s market. Participant teams were tasked with purchasing food for a family of four within limited budget constraints. After interacting with fresh produce vendors, cheesemongers, various sellers and campus dining representatives at the farmer’s market, participants sported pens and texts and gathered to discuss readings on risk and privilege. We prepared analyses that interrogated issues of food production technologies, interspecies dependencies and slow food, drawing from writing by Allison Carruth, Anna Tsing, Angela N. H. Creager and Jean-Paul Gaudillière. We all were asked to bring a food-related artifact, something that speaks of our own relationship to food to create a jumping off point for engaging in the questions of risk and privilege. Such personal artifacts ranged from coffee to eggs to soy-based cosmetics, as well as non-edibles such as a food scale, a mortar and pestle and a reusable water bottle. We talked of preservation and mechanical reproduction encapsulated in a can of cranberry sauce, the entitlement entailed in a jar of gourmet polenta and the caloric emptiness and capitalistic symbolism of a can of Diet Coke. For example, Tessa L. Desmond noted, “Soda companies have changed their marketing strategies to target low income neighborhoods, and kids in particular. Now it’s kind of like the suburbs. We’re vacating fast food and soda like we’ve vacated the cities for the suburbs…” The central concepts of privilege and risk framed these diverse personal food items and our conversation considered the scales of safe-to-dangerous, pure-to-toxic, sustainable-to-polluting, healthy-to-unhealthy and delicious-to-unpalatable. The conversation also turned to issues of culture and identity. What risks might be inherent in transmitting generationally the sense of culture through the vessel of a preserved egg—with some packages labeled lead-free and some, noticeably, not? How can and do ideas about maintaining a sense of cultural identity trump potential health risks? We often get requests here at FoodAnthropology for information on food studies programs and on other resources related to food and nutrition. The collective knowledge of SAFN members (a perk of membership is access to our association listserv) usually allows us to find the requested information, so we are always happy to get requests. However, we have recently been introduced to a new resource which seems like it might also provide people with quick access to information about degree programs (in all kinds of fields related to food and nutrition), conferences, consultants, funding for research and scholarships, publishers, and much more related to food systems. This is the Sustainable Food Systems Sourcebook, which is published by the Thomas A. Lyson Center for Civic Agriculture and Food Systems. This is the same organization that publishes the Journal of Agriculture, Food Systems, and Community Development. The number of categories for items listed in the Sourcebook is impressive. Some areas seem to have many more listings than others, but they are just starting out. If you have a resource you want to list, you can have it included for free for a basic listing (or pay for something more involved). As it develops, this could prove to be a very useful resource. We may have to get SAFN listed! Take a look. Every now and then we run across resources for researchers and activists interested in food systems that may be of interest to our readers. We recently received notice of a series of webinars, organized by the North American Food Systems Network, that provide a forum to discuss food systems issues. The range of issues discussed so far is quite wide: race and agriculture, urban farming, anti-hunger groups and corporate America, etc. The North American Food Systems Network looks to be a very useful resource itself and worth looking into. How effective are communities, local food practitioners, and researchers at evaluating local food system activity? What are the strengths and weaknesses? Has the capacity to evaluate local food market activity improved in the previous five years? How strong and mutually reinforcing are the partnerships between community practitioners, researchers, and food system funders (like government agencies) at collectively and satisfactorily evaluating local food projects? Are there opportunities to advance such a community of practice? How would it look? What are effective strategies for doing so? This webinar will bring some high level insights from the Local Foods Impact Conference April 3-4, 2017. The U.S. Department of Agriculture’s Agricultural Marketing Service (AMS), in partnership with George Washington University, hosted this conference that was designed to explore how to best measure the impacts of local food investments, improve coordination across USDA agencies, and evaluate the extent to which disparate local food investments are complementary and reinforcing. Over 300 people attended with and another 500 tuning in via livestream for the plenary sessions. FYI, here are videos of the mainstage presentations, photos and slide presentations. As background, the discussion for this webinar grew from a 2013 meeting to address the state of economic analysis of local and regional food systems convened by Michigan State University’s Center for Regional Food Systems and the Union of Concerned Scientists’ Food & Environment Program (http://foodsystems.msu.edu/resources/econ-analysis-webinar). Subsequently, in 2014, the USDA AMS convened a team of regional economists and food system specialists to develop a best practice Toolkit for evaluating the economic impacts of local food system activities. This NAFSN Webinar will provide an update on the thinking since that conference and the experience with the Local Food Systems Toolkit. You can visit the NAFSN web site for more information on the webinar series. If there is to be a future where the food system is safe, equitable, and healthy how will we get there? On March 30th, the newly launched Food Studies Program at Spelman College hosted a symposium on Food Justice featuring three Black women activists and scholars who work to improve the food system and health of communities in various parts of the country. The symposium was clear in its purpose: to not only interrogate the successes and limits of food justice but to also highlight the work of Black women that is often invisible, ignored, or co-opted. I left the symposium feeling energized and challenged by the panelists and the audience. I also left with questions. How do we contend with the hypervisibility of Black women’s association with obesity on the one hand and the lack of visibility concerning Black women’s activist, artistic, and academic expertise in food production, preparation and writing on the other? Nettles-Barcélon et al. provide a framework—Black women’s food work as critical space—for understanding how the future of the food system is deeply intertwined with the food work produced by Black women and the barriers that attempt to curtail that work. They argue that because Black women are positioned as both speakers for “the other” while also being Othered, their food work is not simply necessary but critical in the dismantling of an oppressive food system that consistently denies equal access to Othered bodies from which corporations profit. From the scholarly world to on-the-ground organizing, Black women ask difficult questions, put their reputations and bodies on the line, and demonstrate a Black feminist food future attuned to a far-off world in which we are all free. This future is currently being written in the scholarly works about Fannie Lou Hamer and the Freedom Farms Cooperative (White 2017), increasing visibility of Black women vegans outside the normative gaze (Harper 2010), and analyses of Black women’s agency, power and entrepreneurship in the context of stereotypes-turned-metaphors (Williams-Forson 2006). It is engaged with dismantling an unjust and unequal industrialized food system at the nexus of racial justice under the Movement for Black Lives. It is on the front lines on the Fight for $15. It is being built everyday on urban farms, in community gardens, in nonprofit organizations, and in classrooms where Black women’s labor contribute to everyday resistances. It is present in intergenerational storytelling and cross-institutional relationship building. This work is generated from a simultaneous engagement with the past, the present, and a future where the dialectical hypervisibility and invisibility that Black women experience no longer exists. There ain’t no negotiations on freedom. I spent all my time knowing things instead of believing them. And that’s the first step to being free. When you can see past all the things that you know and believe something better. Black women’s food work is often informed by an embodied knowing that it is difficult—if not impossible—to negotiate from the duality of hypervisibility and invisibility. Instead, this food work is rooted in a belief in something beyond. It is not simply a substance of things hoped for or the evidence of things not seen (see Hebrews 11:1 for biblical reference). No. Black women’s food work is the critical space from which the world we want to see is being built. Black women’s food work is, indeed, from the future. While there are many conferences of potential interest to food anthropologists, last weekend (December 3-4, 2016), I attended a conference that I found particularly useful and inspiring: the 6th annual Asian Food Studies Conference. This is a conference that attracts historians, nutritionists, anthropologists, and researchers from fields like hospitality and tourism. The diverse presentation topics included these titles: “Chinese Ancient Food Culture Implied in Oracle-bone inscriptions” (Cheng Xuerong), “The Comprehensive Discourse on Edible Flowers in Pre-modern China” (Liu Jun Li), “Plagiarism and Originality: Focused on the Study of Modern Printed Cookbooks in Early 20th Century Korea” (Ra Yeon-jae), “Nutrition Education Affects the Use of an Escalator and Elevator to Reach a Women’s College on a Hilltop” (Ishihara Kengo and Takaishi Tetsuo), and “Beyond the ‘Super Shark’ Myth: Promoting Sustainable Shark Foodways in Japan and Asia” (Akamine Jun). What really impressed me, however, was the true sense of internationalism evident at the conference. The conference’s venue changes every year. Last year the conference was held in Shangdong, China, this year in Kusatsu, Japan (hosted by Ritsumeikan University), and next year the conference venue will be in Korea. There are presentations in multiple languages (this year: Chinese, Japanese, and English). The first day’s keynote speeches, one in each language, were translated into the other two. But beyond this, the conference theme—Exchange and Dynamism of Food Culture in Asia—encouraged presentations of research that was itself transdisciplinary and transnational, with a mission toward forging connections and sharing knowledge. Takagi Hitoshi explaining how the Miskito categorize and use different parts of the sea turtles they hunt. Let me give some examples. One of the panels on the first day included presenters from Malaysia, the Philippines, the US, Bulgaria, and Korea. All of the research on this panel had an obvious transnational component. A key example of such a project would be Korean scholar Ja Young Choe’s (Hong Kong Polytechnic University) research on the relative popularity of various Asian cuisines (Japanese, Korean, Thai, Indian—in that order) in Hong Kong. On the second day Francoise Sabban’s research on the culinary perceptions of French and Chinese diplomats and envoys in the 19th century, Takagi Hitoshi’s observations from fieldwork conducted among the sea turtle hunting Miskito of the Caribbean, and Osawa Yoshimi’s probing of the simultaneous global appeal of umami and distrust of MSG are other examples. SAFN member Shingo Hamada describing traditional foodways–fishy and fermented–in Fukui prefecture, Japan. Representing SAFN at the conference, Shingo Hamada presented new research on obstacles to commoditizing traditional fermented foods in Japan’s contemporary Fukui prefecture and I explained how Kyoto cuisine has benefited from international support (collaborators, promoters, funders) and resources (ingredients, ideas, technology) from far outside of Japan. Next year, the conference will be hosted in South Korea. I heartily recommend attending to anyone interested in the topics of transnationalism, food, and Asia.